Diamond Systems is an experienced partner for energy customers worldwide. Our single board computers and PC/104 I/O modules are used in wide variety of energy and power applications worldwide, including electric power generation, oil and gas exploration, remote utilities monitoring and control, and others. Our products offer the features and ruggediziation to excel in these harsh mobile and/or remote environments. Wide temperature operation and high resistance to shock and vibration ensure our products perform reliably from the desert to the Arctic. 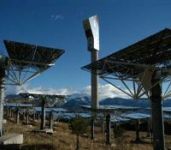 In southeastern France, a government sponsored research project converted a 1980s experimental solar plant into a modern hybrid solar/gas furnace. The existing solar plant consisted of an array of two hundred mirrors used to gather the sun’s rays. To manage the movement and monitoring of the mirror array, one independent motion control computer system was specified for the control of each mirror. Each motion control system was responsible for rotating the mirror along two axes to maximize solar collection.